Ethan Garner, Assistant Professor of Molecular and Cellular Biology, has been named a Searle Scholar. He is one of 15 exceptional young faculty nationwide to receive this prestigious honor from the Searle Scholars Program. The Searle Scholars Program, based in Chicago, supports the independent research of outstanding and innovative young scientists in chemistry, medicine, and the biological sciences who have recently begun their first tenure-track position at one of the 115 participating academic or research institutions. Application submissions are restricted to selected candidates from invited institutions only. Recipients will receive $100,000 per year for three years. “I’m really grateful for this award,” Garner says. “Having the support of the Searle is going to help me launch my research at this early stage of my career.” Among his plans for the Searle project, he will be hiring a postdoctoral scientist and buying microscopy equipment for his research. 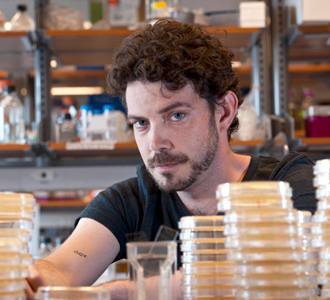 Garner’s work focuses on elucidating the mechanisms of cell wall synthesis in rod-shaped bacteria and its regulation by actin and tubulin filaments. The goal is to discover new points in the pathways to develop antibiotic targets, a pressing need as resistance to natural antibiotics is becoming increasingly prevalent. He uses supermicroscopy, sub-diffraction imaging, particle tracking, biochemistry and genetics to follow the motion and changing structure of single molecules in living cells. Garner joins a community of renowned Searle alumni, including MCB Chair Catherine Dulac (1998). Since its inception, 497 Scholars have been named and over $102 million has been awarded. The Searle Scholars Program was established at The Chicago Community Trust in 1980 and has been administered by Kinship Foundation since 1996.